Many people think that Fifa made the balls light weight in order to encourage long range goal attempts and to increase movement of the ball in the air – unfortunately such light balls are actually tougher to control and are very unpredictable for forwards and strikers! The Fifa approved world cup ball, the Jabulani, which means ‘to celebrate’ in Zulu, was designed and constructed by a group of boffins at Loughborough University – a UK sports focused university. This should ensure an interesting world cup! Fifa general secretary Jerome Valcke says Cape Town Stadium has the best pitch of all the 2010 soccer World Cup venues. Jermoe was talking at the ceremonial handover of the 68,000 seater stadium to Fifa ahead of the start of 2010 World Cup. This comes after Fifa told all stadiums back in November 2009 that the grass that was being grown in South Africa, a local African kikuyu grass, was not green enough for television. Instead all stadiums had to replace the kikuyu grass with a European ryegrass. 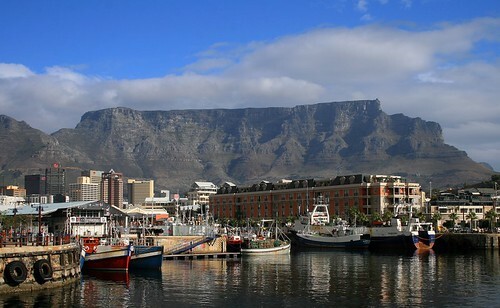 In order to protect the coastal city of Cape Town during the 2010 World Cup the South African navy have positioned themselves in Table Bay, the main entry point to the V&A Waterfront and home to much of Cape Towns World Cup activities. A Joint Operations Centre (JOC) is due to take control of all security, medical emergencies and responses to natural disasters on Thursday 3rd June seven days before the world cup kicks off. The police and the SA National Defence Force’s regional commanders will direct their officers from the JOC at the Harrington Street headquarters in Cape Towns city business district. South Africa is located in the South African Standard Time Zone (SAST) and is 2 hours before Greenwich Mean Time (+2GMT). South Africa does not employ Daylight Saving Time (DST). There are only 18 days left to the kick off of the 2010 World Cup in South Africa, when South Africa will play Meixco in the opening game on the 11th June in Soccer City in Johannesburg. The first is in Bantry Bay. Bantry Bay exudes natural beauty, because it is located just below Lions Head you have stunning mountain views to one side, while still being able to look out over the ocean on the other side. It is also very close to town, the Waterfront and the new Cape Town stadium. Combined with brand new finishes to the highest international standards, including 5 luxuri-ous en-suite bedrooms & a study, large swimming pool, private gym, massage room and security, this very exclusive Villa offers luxury living and privacy in the most beautiful location in Cape Town! The next two properties are both in Clifton. Clifton is best known for its 4 beaches known as 1st, 2nd 3rd and 4th. Clifton has the right combination of sandy white beaches, serene mountain views and trendy hot spots close by for watching the sun go down over cocktails. 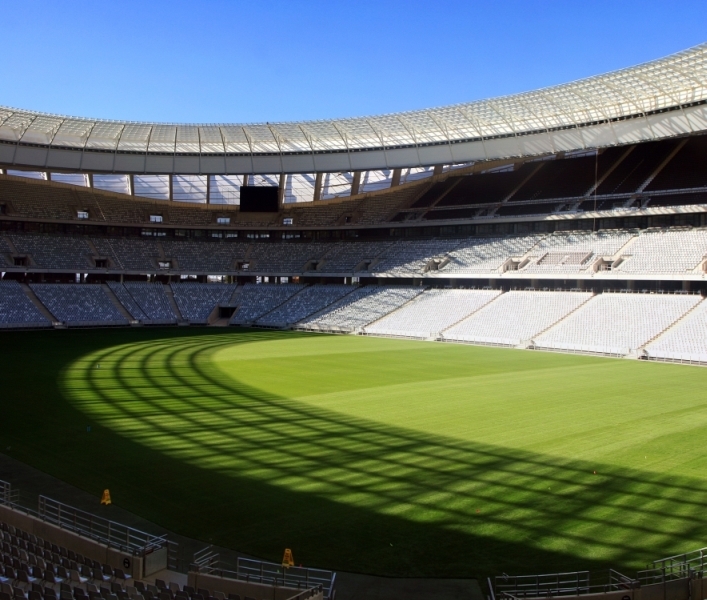 96 000m3 of concrete were used to build Cape Town Stadium. Alot of people traveling to South Africa and Cape Town for the world cup are worried about crime and being safe. Here are a few tips to ensure you have a safe enjoyable stay during the World Cup, most of the tips will be Cape Town focused but are applicable for the whole of South Africa. The V & A Waterfront is geraring up for a 30 day party as it puts on special events during the 2010 World Cup – on match days in Cape Town the party will crank up another notch. As one of Cape Town’s best-known tourism jewels, and a neighbour to the Cape Town Stadium, the V&A Waterfront is a prime catchment area for locals and visitors in search of the football experience that will thrill the Mother City during June and July. We’ve partnered with some big brands in football such as Coca-Cola, adidas and MTN to ensure an interactive offering which is tailored for fans in search of World Cup celebrations in a safe and secure environment. And, as a hub for celebrations all year round, welcoming on average 1, 7 million visitors every month, and more than 160 000 every New Year’s Eve without incident, we are fully equipped and ready to host the influx of visitors during the World Cup period. Each of the 4 zones will offer football fans the chance to watch all games live, eat great food, drink great beer and wine, listen to live music, buy local food and drinks and have the chance to take part in interactive Football games! For more information on how to get there and what you can expect head on over to the dedicated Waterfront 2010 website (http://2010.waterfront.co.za/).